Football fans, your day has come. Today marks the the start of the NFL season. For many teams comes a fresh start, a clean slate. For others, comes a window of opportunity. As is tradition, the opening day of any of the big four sports leagues means that it is time for me to unveil my season outlook. Here’s my division and playoff picks for this year. NE- Tom Brady’s “suspension” would have been a major blow but now that they’ll have him for all 16 games, the Patriots are the team to beat. NYJ- The Jets made some major acquisitions this offseason in Revis, Cromartie and Brandon Marshall, just to name a few. Losing Geno Smith for a few weeks will hurt, but with an easy schedule, the Jets will coast. MIA- The Dolphins defense will carry them, but ultimately the AFC East will be run by the Patriots and Jets. BUF- Last year I wrote: “Sammy Watkins could be a great addition but it doesn’t mean anything if he doesn’t have a strong QB.” The same holds true for this season. LeSean McCoy will help, but they’ll need that next level quarter back if they want to take the next step. BAL- I feel like the Ravens have an easy schedule right in the middle of the season, but at the end of the season they won’t be able to get it done. CIN- Andy Dalton and AJ Green will carry the team, but will fall just short of the playoffs. CLE- I’m not sure that Johnny Football and Josh McCown have what it takes to bring the Browns very far. They’ll struggle. 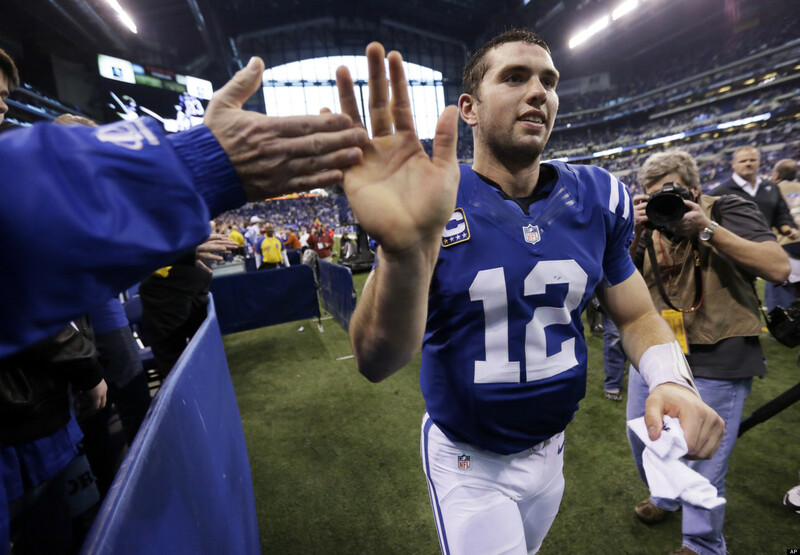 IND- Last year’s prediction: “Andrew Luck will lead one of the top offenses in the league on a journey that could go deep into the playoffs.” Ditto this season. HOU- I think that this is the year that Houston takes the next step. This will be a fun defense to watch. Watt rushing from one side, Clowney from the other side, and Wilfork up the middle. Scary. JAX- They still have much room to improve but Bortles will be good this year. TEN- Marcus Mariota will help, but not in this division. DEN- I think that Peyton is still a top quarterback, and he’ll carry them back to the playoffs again. SD- Philip Rivers will have another good year, and Melvin Gordon will be a top 10 rusher. KC- I like this team but can’t take them to go into the playoffs. Jamaal Charles will be a top 5 rusher though. OAK- Another year, another tough schedule. Sorry Raiders fans but the AFC West is tough. NYG- This is the year of the Giants. I think that Eli is back (Yes, really.) and OBJ will have another huge year. DAL- The Cowboys will be ok this year. The loss of DeMarco Murray will show though. WAS- A QB controversy will overshadow this season, and that will be the downfall of this Redskins squad. GB- Aaron Rogers will be the top NFC QB. Period. He’ll lead the Jordy Nelson-less Packers on another deep playoff run. MIN- AP is back and that means big things for the VIkings. Teddy Bridgewater must rise to the occasion though. DET- The loss of Suh will hurt but not too much. Matt Stafford will still lead the Lions offense to a seven win season. CHI- Brandon Marshall is gone. While many Bears fans think it’ll be a good thing, I’m saying that it won’t be. They’ll struggle. NO- I think that the Saints will be the top team here. CAR- Kelvin Benjamin will be missed. Not sure that Cam Newton can get much done without him. SEA- They’re still elite. The addition of Jimmy Graham doesn’t hurt either. STL- Nick Foles comes in and I like him this season. Todd Gurley will make noise when he plays too. SF- Carlos Hyde will power this team. Kaepernick won’t. Since their entire defense left, I’ll take them out of the playoff picture. I think that the Colts get to the Super Bowl after a rematch of last season’s AFC Championship. I know. I’m big on the Packers this year, but for good reason. Eddie Lacy gets it done in Seattle and powers the Packers into the Super Bowl. In a battle of the QB’s, Andrew Luck comes out on top. TY Hilton catches three touchdowns and is named Super Bowl MVP. I hope that everyone enjoys this NFL season. Stay tuned in to Dabuzzza this season as we bring you weekly analysis and fantasy football picks.